I have recently acquired two new things – one – a ‘gluten free’ friend (a diagnosed coeliac) and two – a new electric oven – what better than to combine the two and try out a few new recipes! My first ‘gluten free’ attempt was some chick pea flat bread which was actually quite tasty but the first time I made it I was still using my trusty old gas cooker with eye level grill – 100 years old at least! Now I had to make the flat bread in my new electric oven – the top oven is apparently a grill. I decided to use the flat bread as the outer casing of my alternative ’empanadilla’ – those of you familiar with Spanish cuisine will know it as a typical Galician dish, traditionally made with a dough (or pastry) base and topped with peppers and tomato and fish, usually tuna, though the one made for us by my husband’s aunt many moons ago in Villagarcia de Arosa contained ‘anguila’ (eel) – and delicious it was too. For my take on this traditional recipe (well, if Jamie Oliver can say that , so can I!) I used smoked trout, roasted peppers and tomato pesto. Verdict on the oven ? Don’t think the grill was hot enough – the flat bread took ages and came out almost like biscuit. Verdict on the empanadilla? – not bad! I would do it again. To make it just whisk up some chick pea flour, water and salt, turn into a shallow, oiled pan and put under a hot grill – takes just a few minutes. Or cook on the hob as you would a crepe. Use the flatbread as your base, spread some tomato pesto onto it, then your fish and top with roast peppers – the more colourful the better – and – voilà! 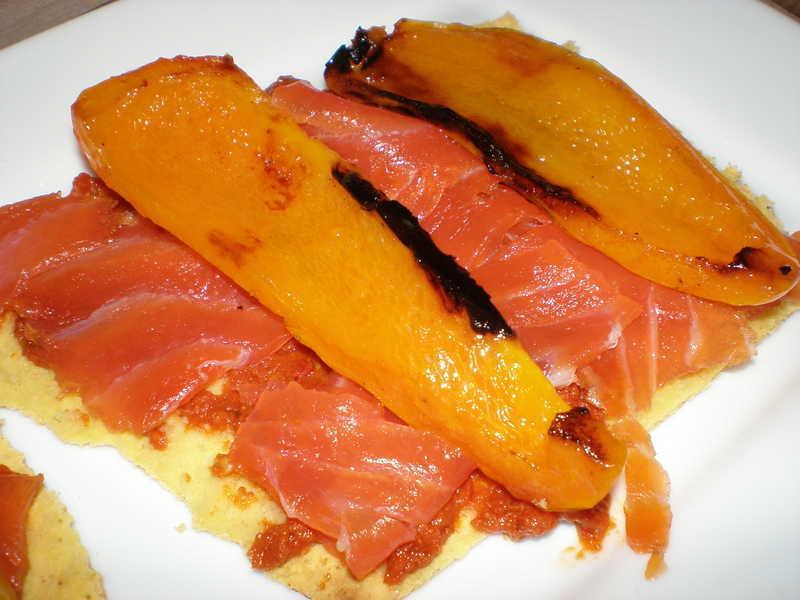 Empanadilla de trucha ahumada – delicious washed down with some sauvignon blanc.